At Tiger Log Cabins, we believe that the finishing touches of your building are as important as the building itself. That is why all our doors and windows are elegantly crafted in the UK, using furniture quality redwood, and built to meet your requirements. We offer left or right hand hinged doors, as well as the option of outward or inward opening doors, to ensure the perfect entranceway to your new sanctuary. We also know how important protecting your log cabin is, and we offer complete piece of mind in terms of security. All our doors have 3 or 5 lever locks fitted, which are far more superior to cheap euro cylinder locks which most other cabin companies use, meaning your log cabin and its contents are fully secured. And all of our doors have traditional, not euro pin, hinges which provide added security against intruders. 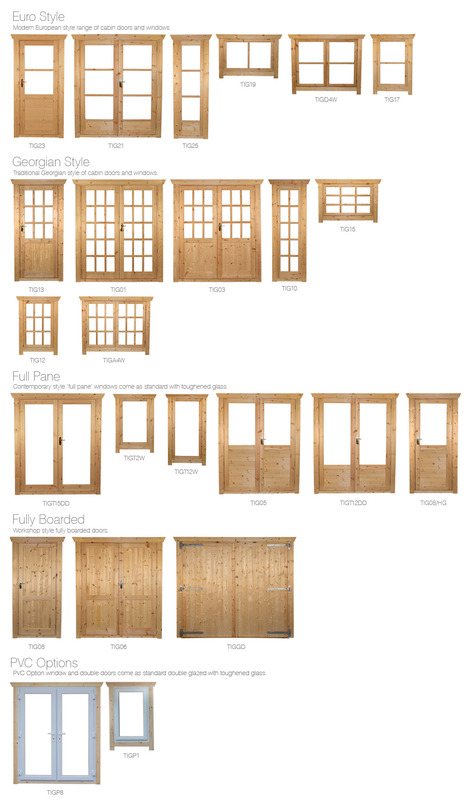 Possibly the most important and unique aspect of our log cabin doors and windows, which ensures the highest quality throughout, is that all our doors and windows are hung with a rebated frame. This consists of a solid section of wood with a piece cut out to form the frame, as you would find on a house with timber doors. Many log cabin manufacturers use a square flush, where the door is then rebated to sit over the frame, a method we don’t consider to be especially good as the door frame can become prone to twisting and warping. All our log cabin doors are built with a very generous internal walk through height of 1880mm (6ft 2in), allowing plenty of headroom at the entrance. As well as offering superb build quality and security, we specialise in providing stylish, elegant door and window styles, allowing you to finish your cabin the way you want. Whether it’s our larger pane Euro Style or rustic Georgian style, as shown below, there really is a design for everyone. Not only are our designs aesthetically pleasing, all our log cabin doors and windows are factory draught sealed, ensuring the elements are kept at bay when the colder weather arrives. But when summer arrives, nothing invites the light into your cabin like the full pane windows and doors we offer. All our windows come top hung as standard, and are available left or right hand hinged. We also provide a lock and key with every window, which not only presents you with added security, but offers a good source of ventilation in the long summer months. We also offer different glazing options on our windows and doors, as shown below. As standard we offer our windows glazed with 3mm horticultural glass, but there is the option to upgrade. For safety and strength we offer 4mm toughened glass, offering complete assurance from accidental damage. 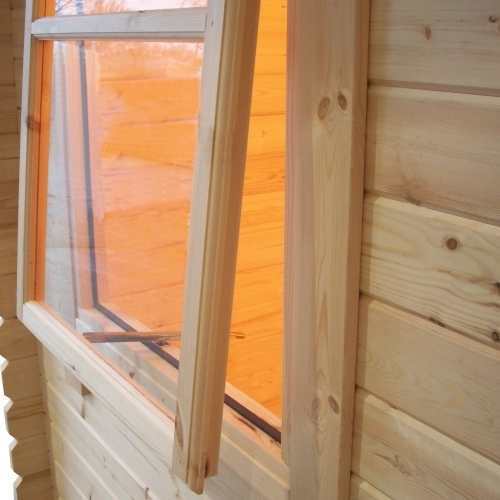 We also offer double glazing, which can not only help to insulate the building, but can help to reduce outside noise, perfect if you are wanting to use your log cabin as an office space or studio. Our highest level of security and safety for your windows and doors is toughened double glazing. Combining specially made toughened glass, with the benefits of double glazing, this really is the greatest way of making your space safe, secure and insulated.